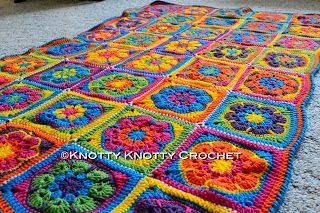 Knotty Knotty Crochet: bright flower afghan FREE PATTERN! 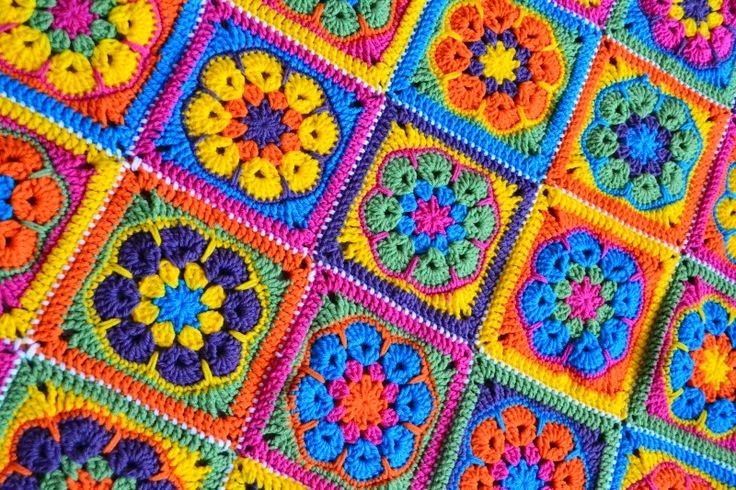 bright flower afghan FREE PATTERN! Here is a little something to brighten your day! Little miss S. came with me to the yarn store one afternoon. I just love these mother daughter outings as I don't get many of them with just me and one of my kiddos. I was surprised to see her get just as excited as I do when checking out all the new colors and yarns. For a small town we really do have a wonderful yarn shop. While there I realized that she is the only one of my four children that I had never crocheted a blanket for. The other three got one at birth. So I let her pick some colors. She started with bright orange and peacock blue (her favs) then added in bright pink, school bus yellow, plum, and ......wait for it.....forrest green. GACK! I tried to persuade her gently that the forrest green might not look that great with all these bright cheery colors she had picked. Nope. She was determined to go home with the dark green. Being the supportive mother I am (ha!) I lovingly purchased the yarn and we went home. 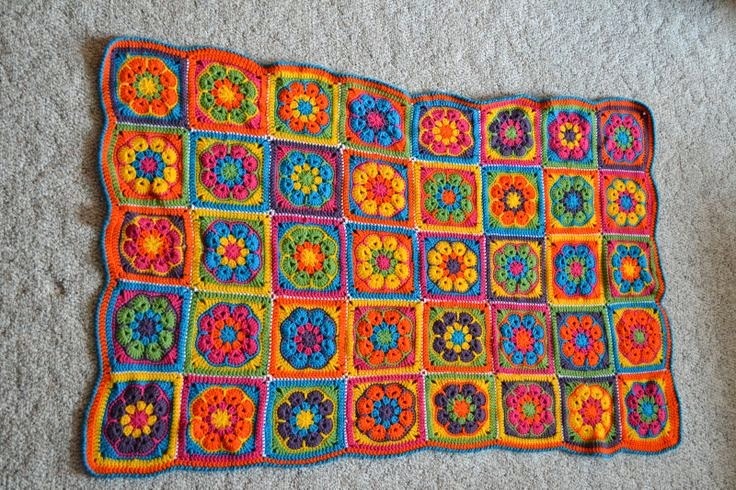 A few days later we sat down and did a google search for afghan blocks. It was so fun seeing her ooo and ahhhh over the same stuff I would have loved! 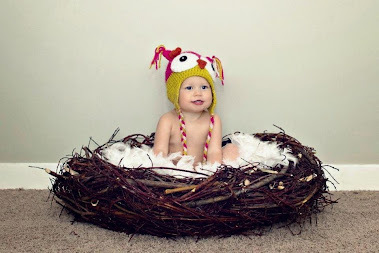 She is a very creative girl and she has got a keen eye for design. Move over Nate Berkus! Anyway. After seeing many different blankets and block designs she said to me: Mom. That dark green isn't going to work at all. Can we go back and get the bright green. (The one her mother originally suggested?? Yes.) So like a good mom thats what I did. I got the right green and it all came together. She settled on just one block pattern. Here it is. I found it over at Made in K town. I like the colors on her blog, but the colors my daughter picked are just so fun and cheery. It brightens my day. Almost as much as my daughter does. 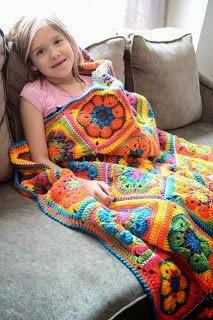 Beautiful daughter and amazing blanket! Thank you for sharing. My gosh I love this! The colors are fabulously well used here! Wow! What method did you use to attach the squares together? I just stitched them together with white yarn. Not my favorite way of doing it but I really struggled with what color to use and how to attach them. You could use any method.